Mad Kings is timeless but never dated, The music is a blend of Progressive and Classic Rock with a hint of Jam, evident in the guitar solos and the virtuosity of the rhythm section. Their music is pulsing and indefatigable. Mad Kings band members are palpably talented , “musicians-musicians,” and the songs are unique and characteristic of Mad Kings. Power Trip is the lead off single to Mad Kings much anticipated EP Throne Room. Throne Room is an adrenaline rush of original rock material produced by Tony Shimkin (Nine Inch Nails, Paul McCartney) and Grammy award winning Engineer John Seymour (Santana, Chris Whitley, TSO). The world wide digital and physical release distributed by Ingooves is set for June 12th 2015 Mad Kings approach both their recordings and live concerts with an electricity and swagger reminiscent of the worlds most beloved rock bands. Mad Kings is timeless but never dated, The music is a blend of Progressive and Classic Rock with a hint of Jam, evident in the guitar solos and the virtuosity of the rhythm section. Their music is pulsing and indefatigable. Mad Kings band members are palpably talented , “musicians-musicians,” and the songs are unique and characteristic of Mad Kings. Mad Kings are as much of a fixture at the legendary Stone Pony in Asbury Park, NJ, where Bruce Springsteen began, as they are on the festival and prog rock circuits. Their fans are loyal and emphatic. They made a much talked about appearance at the October 2014 Souper Groove Festival, thrilling crowds and broadening their fan base. Mad Kings rhythm section is Austin Blau, the quintessential “monster drummer.” who effortlessly plays like a man possessed, but with a contrasting calmness of spirit and Bassist Matt Sonzogni who is mild mannered and sometimes taciturn. The band came together over a box of Fruit By The Foot, (“glorified” fruit roll ups.) 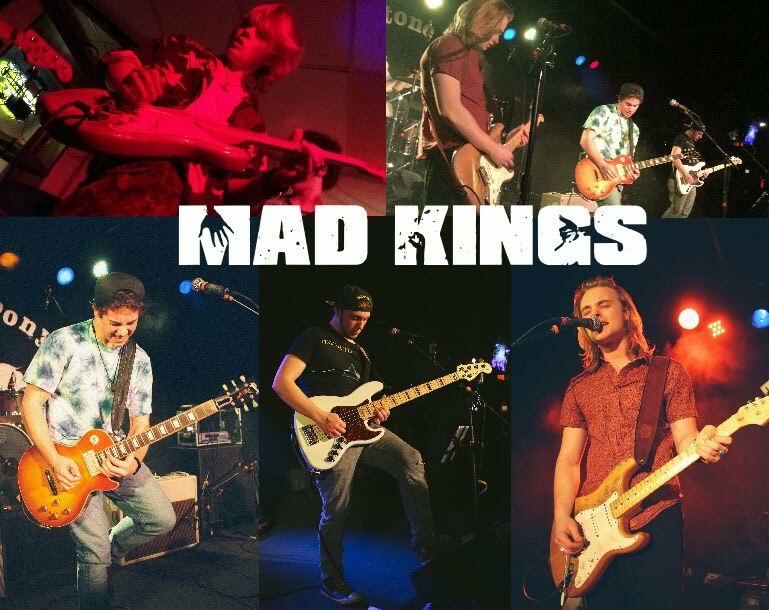 After playing together for a few months they named their band Mad Kings.